Laser Cataract Surgery offers the most precise and predictable visual outcomes available, and our surgeons at Diagnostic Eye Center in Houston are proud to offer this revolutionary technology to our patients. While traditional cataract surgery is a safe and successful procedure, the LenSx® Laser replaces many of the steps previously done by hand, increasing the level of precision during the surgery and allowing our surgeons to achieve better results than ever before. In addition to Laser Cataract Surgery, advanced technology intraocular implants give our patients throughout the Houston area patients more options for clear vision at all ranges, allowing us to customize your results for your lifestyle. It is an exciting time to have cataract surgery! The doctors and staff at Diagnostic Eye Center are ready to answer all of your questions and will help guide you along this process. A cataract is a term used to describe clouding of the natural lens inside the eye. In young people, the lens is not only clear, but flexible. The flexibility of the lens allows it to change focus for objects at different distances much like a camera does, meaning that vision at both far and near is sharp. As we enter our 40’s, the lens begins to change. It becomes less and less flexible with every passing year, resulting in the gradual loss of the ability to focus up close over time. It also becomes more cloudy. Once the lens clouds enough to affect vision, it is called a cataract. This process is a normal and expected part of aging — every single one of us will eventually develop this condition if we live long enough. There is no good medical treatment for cataracts — the only treatment for cataracts is surgical removal and replacement with a clear Intraocular Lens (IOL) implant. At our Houston Clinic, cataract surgery is performed as an outpatient procedure and only takes about ten to fifteen minutes. Patients are given mild oral or IV sedation, and eye drops are used to numb the eye. Our surgeons first use the LenSx femtosecond laser to make small incisions on the front of the eye, to create an opening in the capsule to access the cataract and to correct small amounts of astigmatism. Then in the operating room, the cataract is removed using a procedure called phacoemulsification, which involves an ultrasonic probe that dissolves the cataract. An intraocular lens implant is then placed inside the eye. Following cataract surgery, patients use antibiotic and anti-inflammatory drops for about four weeks. Strenuous activity should be avoided for one week, but most patients return to a desk job the day after surgery. As with any surgery, complications and side-effects can occur. Fortunately, the rate of complications from modern cataract surgery is very low. Your surgeon will discuss possible complications and side effects with you at the time of your consultation. Astigmatism Correction. In an eye that has astigmatism, the vision is blurred because the cornea (front surface of the eye) is shaped more like a football than a basketball. The LenSx laser can reduce small amounts of astigmatism by reshaping the cornea, resulting in better vision without glasses. More Precise and Customized Corneal Incisions. In traditional cataract surgery, the surgeon makes tiny incisions on the front of the eye with a small blade. Using the innovative technology of the LenSx Laser to make these incisions provides greater precision and control. Better Intraocular Lens Placement. One of the greatest capabilities of the LenSx Laser is its pristine and reproducible capsulorhexis formation, which creates an opening in the lens capsule to allow access to the cataract. The laser makes this opening as a perfect circle with the exact same size and position every single time. This allows more precise placement of the intraocular lens and ultimately more predictable visual outcomes. Automated Cataract Fragmentation and Easier Removal. The laser fragments the cataract into pieces and softens it. You can think of it like putting a cookie in the microwave for a few seconds or dipping it in milk, making it soft and crumbly. This makes removal faster and easier. Faster Recovery Times. Because the LenSx Laser fragments and softens the lens, less ultrasound energy is needed to remove it. This results in less swelling and faster visual recovery. What is the ORA System™? Intraocular lens (IOL) technology is continuously advancing, which means that our surgeons can offer a more customized surgical plan to give you the best visual results for your lifestyle. Every patient is different, and our doctors will take the time to understand your unique visual needs and help you choose the best intraocular lens for your eyes. Dr. Marc Sanders and Dr. Andrew Salem, along with our team of ophthalmologists in Houston will discuss your cataract surgery options with you. 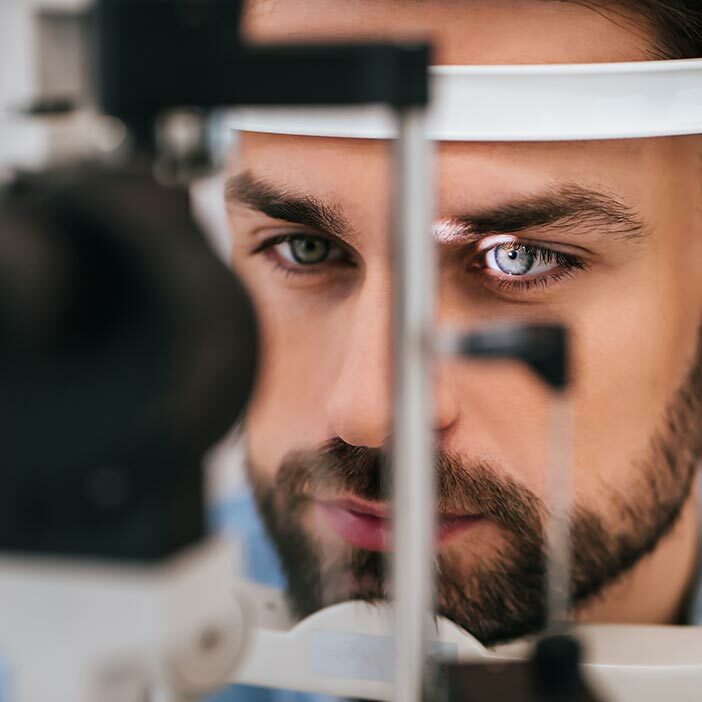 If you are motivated to reduce your dependence on glasses and contacts, ask your surgeon if you are a candidate for an advanced technology IOL. The first in a new category of IOLs called Extended Depth of Focus (EDOF) IOLs, the TECNIS® Symfony lenses are the only lenses in the United States that provide a full range of continuous high-quality vision from distance to arm’s length, and sometimes closer. This exciting new lens technology, FDA approved in July 2016, also includes a version of the lens for people with astigmatism, the Tecnis Symfony Toric IOL. The goal of the Tecnis Symfony lens is for patients to have good distance and intermediate/computer vision with less dependence upon glasses. Some patients may still need readers for small print. Multifocal lens implants are designed to help patients see at varying distances, similar to wearing bifocal glasses or multifocal contacts. By use of diffractive and refractive optics, these lenses provide distance and near focus at all times. Your brain learns to adjust and chooses the appropriate focus for the current task. Some patients report seeing rings or halos around lights at night, which typically become less noticeable over time through a process called neuroadaptation. The ReStor® Multifocal IOL is available in two different reading powers, depending on a patient’s preferred reading distance. The ReStor® Multifocal Toric IOL is now available for patients with astigmatism who also want to reduce their dependence on reading glasses. The TECNIS® Multifocal intraocular lens has three different reading powers available, which can accommodate patients with varying visual demands. Patients with large amounts of astigmatism are often candidates for toric IOLs. Astigmatism occurs when the eye has more power in one direction than the other, causing light to focus at two points in the back of the eye instead of one. Toric lens implants are designed to correct significant amounts of astigmatism and are now even available as multifocal lenses. Our surgeons will measure the exact amount of astigmatism in your eyes and discuss the best option to correct it. With advanced Laser Cataract Surgery and the new ORA™ System technology, our doctors are able to achieve more precise toric IOL placement and even better visual outcomes. After surgery, many patients develop a haze in the membrane behind the intraocular lens (IOL) implant, causing blurred vision and glare at night. This common condition, known as posterior capsule opacification (PCO), is sometimes referred to as a “secondary cataract” due to the similarity of symptoms. Cataracts, however, never recur following surgery. PCO is easily treated with a quick and painless procedure called a YAG Laser Capsulotomy. What causes posterior capsule opacification? Posterior capsule opacification may be thought of as a scarring process that occurs in the capsule, or bag, which contained the natural lens of the eye. During cataract surgery, this capsule is left in place to hold the new intraocular lens implant. Proliferation and migration of lens epithelial cells onto the capsule after cataract surgery cause an obstruction of vision. Posterior capsule opacification is not preventable, but it is easily treatable. Posterior capsule opacification may be treated with a minor laser procedure known as a YAG Laser Capsulotomy. YAG stands for Yttrium, Aluminum, and Garnet crystals used to generate the laser. Is a having YAG Laser Capsulotomy similar to undergoing cataract surgery? No, it is much simpler and faster than cataract surgery. No anesthesia is required. Once you arrive at our Houston surgery center, the eye is dilated. Your surgeon then uses a laser to create a central opening in the hazy capsule located behind the intraocular lens implant. No. You will hear small clicks or pops, but because the capsule has no pain fibers, the procedure is entirely painless. Patients may resume normal activities immediately, though are instructed to use anti-inflammatory eye drops for about a week. Most patients notice visual improvement within a day of having a YAG Laser Capsulotomy. Will I have increased floaters after YAG Laser Capsulotomy? Patients should anticipate some “floaters” in their vision following this procedure, which will likely resolve within a few weeks. Serious side effects are rare.